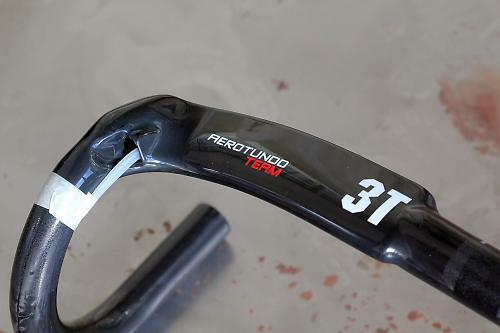 The 3T Aerotundo Team is a good carbon fibre handlebar that combines round drops with aero-section tops, but be careful with the sizing to make sure you get the right fit for you. The tops are a new aerofoil section design. Rather than being round, they're much deeper front to rear (up to 48mm) than they are tall (it varies, but up to 19mm), tapering off towards the trailing edge. The idea, of course, is to minimise drag, although 3T don't make any claims about the amount of time this bar is going to save you over a given distance. The drops are round, and at 139mm (the vertical distance from the centre of the bar at the clamp point to the centre of the ends) they're a medium depth. You'll probably have your own preference there. Compact designs have become very popular over recent years, often with a drop of about 125mm, and 3T's own Aeronova Team bar, with a similar aero tops design, has a drop of 127mm if you want something shallower. The feature of this bar that really surprised me, though, was the reach (the horizontal distance from the bar at the clamp point to the furthest point forward). The bar that I took off my bike had a reach of 83mm. The reach here is 113mm. That's a lot! It meant that the levers were 30mm further away than before and I had to swap the stem to bring them back in. The width at the hoods is the same as at the ends rather than being a little narrower there, and that also contributes to the rangy feel of this bar. That's not a problem but make sure you've done your homework on sizing before putting in an order. The cables run internally, which means you have to reinstall both the brake and gear cables when you fit the bar rather than just swapping the levers over and putting on new tape. Once I had everything set up right, this handlebar put in a very good performance. I really like the round drop shape, and a long straight section towards the ends allows you to choose a position that feels exactly right. The long reach means resting your hands on the hoods puts you into a very different riding position from when you have your hands on the shoulders of the bar. The shaping is unusual in that the tops dip down slightly away from the stem clamp point and then the shoulders rise up a little (check out the picture and you'll see what I mean). It might sound a bit strange but it all works to give you a whole bunch of comfortable hand positions. I've found the Aerotundo Team bar to offer quite a bit of give when you're down on the drops, which helps isolate you a touch more than normal over rougher road surfaces. The downside to that is you might want more stiffness when it comes to sprinting, if that's your thing. The Aerotundo Team comes in 40, 42 and 44cm widths and can be fitted with clip-on aero bars; you get 2cm or so of available round bar space either side of the stem clamp. 3T says, "Aerotundo is a traditional round road drop with aero-section tops to complement the latest aero road bikes. The tops are a new aerofoil section designed for the least-possible drag permitted by UCI rules. Cable routing is internal for less drag, a sleeker appearance, and reliable setup of manual or electronic gear systems. The bend is medium-deep and square like Rotundo's, with 139-mm drop. Width at the hoods is the same as at the ends. Aerotundo Team is built in all-carbon-fiber and finished UD Gloss Black with 3T's new 'Road' brand graphics. It can be fitted with 3T and compatible Clip Ons for added versatility." Well made and the finish is very attractive. There are certainly lighter bars out there but given the depth, reach and the size of the aerofoil tops, this is a light bar. Plenty of comfortable grip points. 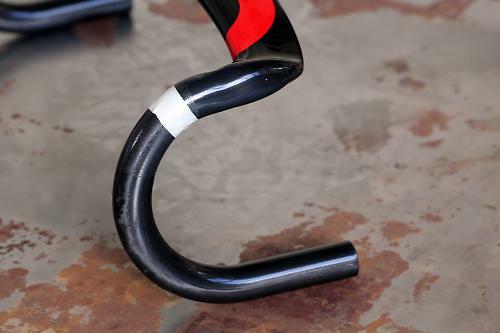 I wouldn't get this bar if I wanted stiffness for sprinting. Good insight into the sizing of these. After reading the review of the Tornova, I got one for myself and it took a while to get a comfortable lever position. The trad bend Chiefs more of a dropped hood position when compared to a compact bar that gives quite a flat transition from bar top to hoods. 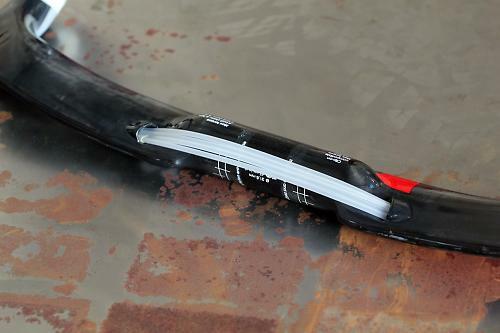 Would've been interesting to see the bar/lever on the bike for comparison.